Judge Dredd has been around a long time. He is the future’s favorite lawman and sometime ago he became a werewolf. Reprints are a fantastic thing cause we get to relive comics of the past. Admittedly, I personally have never been kept up with Judge Dredd comics. It’s weekly release dates make it somewhat tedious at times. That being said, Judge Dredd typically is an excellent read. The character is always true and consistent to his style and character. Cry of the Werewolf is an impressive body of work. Steve Dillion produced a tremendous amount of artwork in a short amount of time. 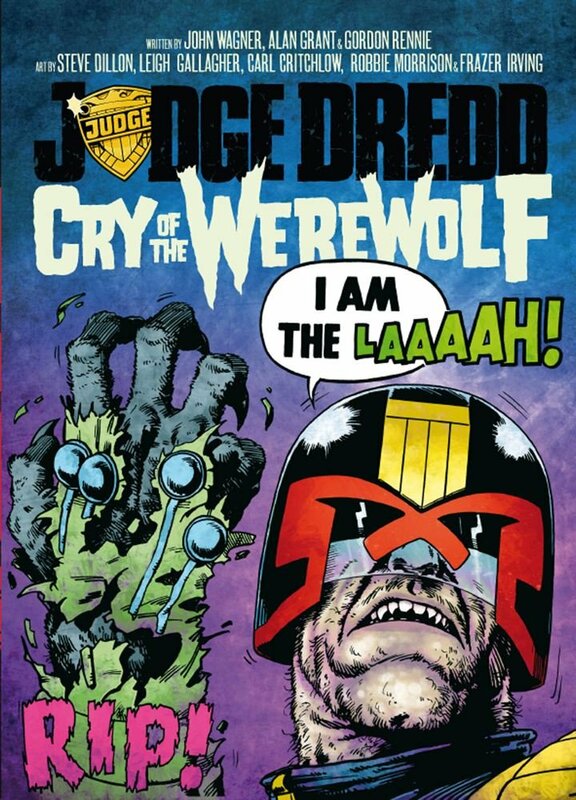 This story revolves around Dredd vs Werewolves. I enjoyed the fact that the “wolves” were very much like many of the creatures we have seen in several other media forms. It’s that familiarity that brings the scary aspects of the wolves and the possibility of having your neck ripped out to life. Having Judge Dredd the focus of the story makes it even better since all he sees is law breakers that need judged. It’s a nifty story for a solid read. The only exception would be the chapter breaks are in color. It makes us want more from the tale. It’s not a great transition, but can be overlooked since the overall issue is so much fun.